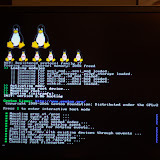 don't forget to set your root password and good luck - rebooting now should yield your gentoo install!!! you can bypass the long kboot timeout period by hitting <ENTER> at the prompt (just like lilo, grub, etc). 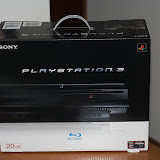 you can add the useful ps3 utilities at any time (ps3pf-utils), they are on the source cd. almost all of this is rpm so you need the rpm2targz ebuild installed to convert them into tarballs. these utilities are useful because they allow you to change the video mode and set the os boot flag in the ps3 flash so you can get into game mode again. you need to copy the file /usr/src/linux/include/asm-powerpc/ps3av.h to the working directory of your ps3pf-utils when you build them so they can be make and make install-ed. now that i have gentoo installed and i can boot into it at will, i will be working on getting x installed. this is where i left for the evening to sleep so i can get up and wait for wii. more to come after gcc spends forever compiling. also, dont forget to check your profile to make sure you are going to be using gcc 4.x, not 3.x. its also helpful to make sure to start ssh once you are chroot-ed into the live cd, set a root password, and also start screen so you can log in remotely w/o problems. i wanted to test using an HDMI-DVI cable to hook up w/ a non-HDCP-compliant PC LCD monitor, but i never got around to it. i also never tested the ATRAC, MP3, or wave playback audio features. whitesanjuro@gmail.com - mark.s.daly@gmail.com - Mark Daly wrote this page originally in 2006, updated 2016 for proof in the PS3 "Other OS" litigation.